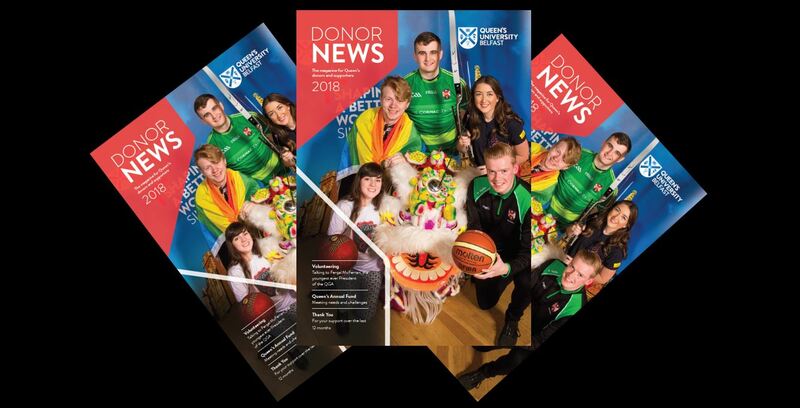 Donor News, the dedicated publication for supporters of Queen’s University Belfast, is currently being mailed to over 8,000 donors and volunteers around the world. The 24-page review of the University’s fundraising activities during 2017, the magazine reflects how alumni, trusts and foundations, local and international companies and non-graduate supporters are making a huge difference to those studying and working at Queen’s. In his foreword, the University’s Acting President and Vice-Chancellor, Professor James McElnay paid a special tribute to Professor Patrick Johnston, who died suddenly last June. “Professor Johnston was a truly inspirational and visionary leader, who never accepted second best and who inspired those around him to “dream no little dreams”, he said. The current Donor News reflects that culture of excellence, featuring as it does stories on widening access to third level education (pp8-9), alumni volunteering (pp10-11) and Queen’s 10-year partnership with Santander Universities. This issue also includes news of memorial benches (p7), projects supported through the Queen’s Annual Fund (pp12-13) and the latest medical fundraising update (pp15-17), plus articles on the Social Charter and the importance of legacy planning. As Editor Gerry Power points out, Donor News is a publication to acknowledge all those who support the University and to highlight the importance of alumni altruism. “Donor News gives Queen’s a chance to say thanks – on behalf of all those students and staff – who have benefitted from the wide range of generous gifts of time and money received by the University in the last year. An online version of Donor News can be viewed here. To request a hard copy please contact Jacqui McCormick or telephone +44 (0)28 9097 5378. Whether you are already a Queen’s donor or volunteer – or are reading Donor News for the first time – we’d like to receive your feedback by clicking on the links below. If you'd like to make a gift to Queen's, or to find out more about current areas of University research and other projects that need your help, please click here or call +44 (0)28 9097 3114. General inquiries to Gerry Power, Communications Officer/Editor Donor News, Queen’s Development and Alumni Relations Office; tel: +44 (0)28 9097 5321. Competition is open to all Queen’s alumni. Entries must be made using hard copy or online survey form only. Closing date for completed entries is 30/03/18. Winners will be selected at random after closing date. Winners must agree to appear in publicity. No cash alternative available and judge’s decision is final.